Our plan for the day was to head to the Skytree. I was surprised when we arrived to see an aquarium at its base: Sumida Aquarium. After our Skytree tour we decided to check it out since we literally had to pass right by it on our way out. It isn’t super large but it is brand new and very well done. They had a jellyfish laboratory where they are breeding jellyfish and you can see the jellyfish at all different stages, from 5 days old, 1 month old, 3 months old, etc. It was an impressive collection. They also had some interesting fish which I had never seen before. My kids enjoyed this “Rock Fish”. If you look closely you will see it’s mouth and eyes. There was also a large tank of these fish that look like worms sticking up from the sand. I can’t remember their name but they were fun to watch. 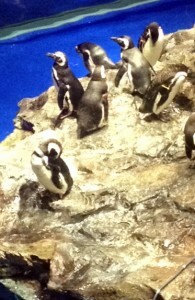 Of course they have all the usual stuff like penguins and seals and a large tank with shark. It is entirely indoors. We were happy just to be out of the summer heat. 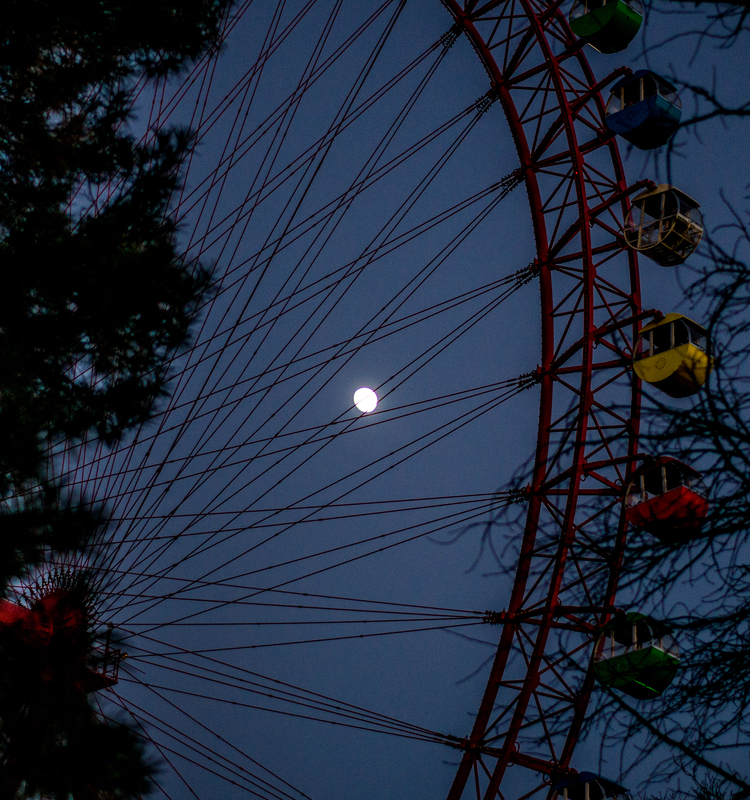 I don’t think I would make a separate trip just for the aquarium, however, if you are planning to visit the Skytree it is worth adding an extra hour or two to your plan if you have children with you. 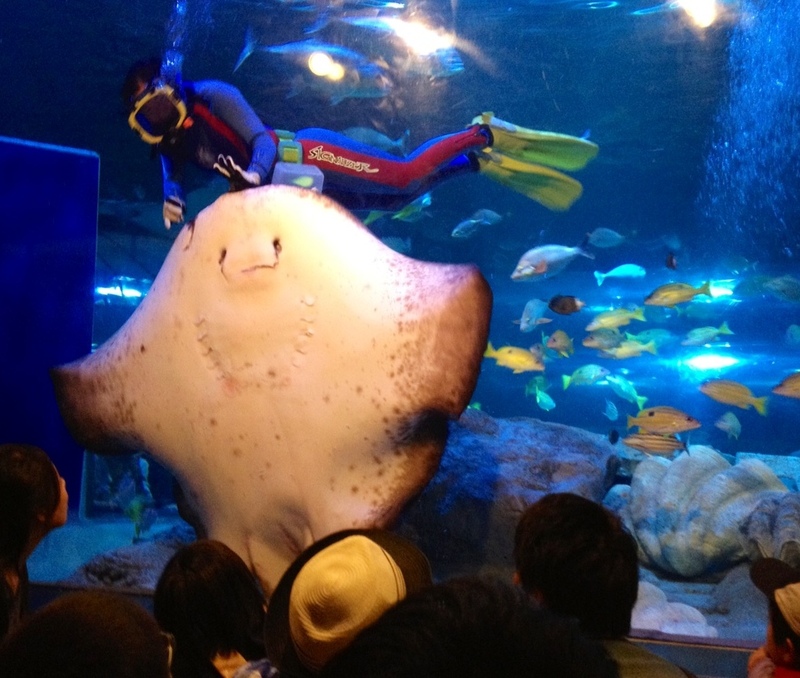 Find more aquariums: Hakkeijima Sea Paradise; Shinagawa Aquarium; Tokyo Tower; Sunshine City. Aquarium and Amusement Park all in one – there is enough going on at Hakkeijima Sea Paradise to spend an entire day – it is like a smaller version of Sea World. We went on a Monday in June and the park was almost empty. 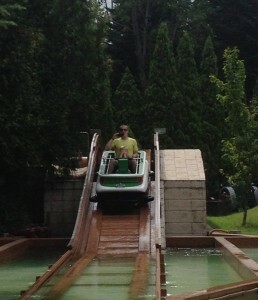 There were no lines for rides! 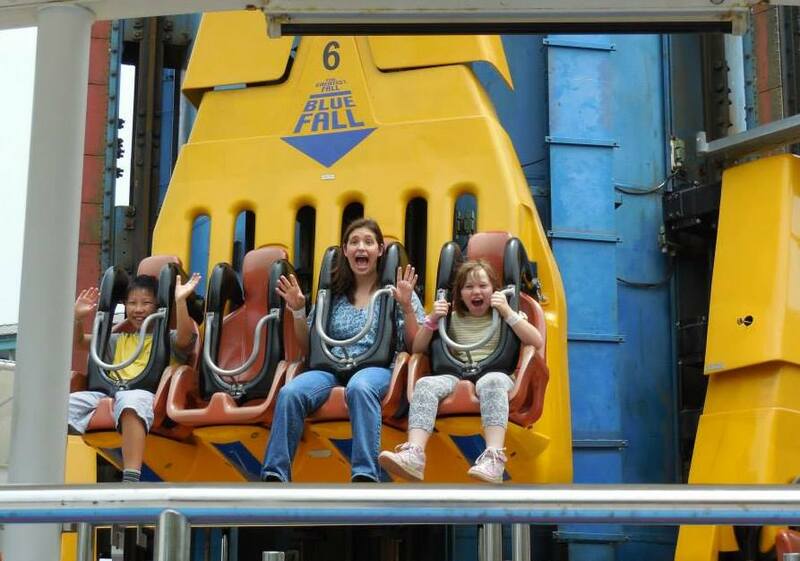 Rides are based on height, with some rides open to all and others limited to 110, 120, and 130 cm and above. The two biggest rides were a nice steel roller coaster and a huge stomach dropping free fall, but there were also plenty of rides for little ones like the teacups. You can either pay for rides individually or purchase an all-in-one pass that includes the aquariums and rides. They advertise three aquariums, but there was really one big building (aqua museum) that has your normal aquarium fish plus a polar bear, walruses, and a sea life show. 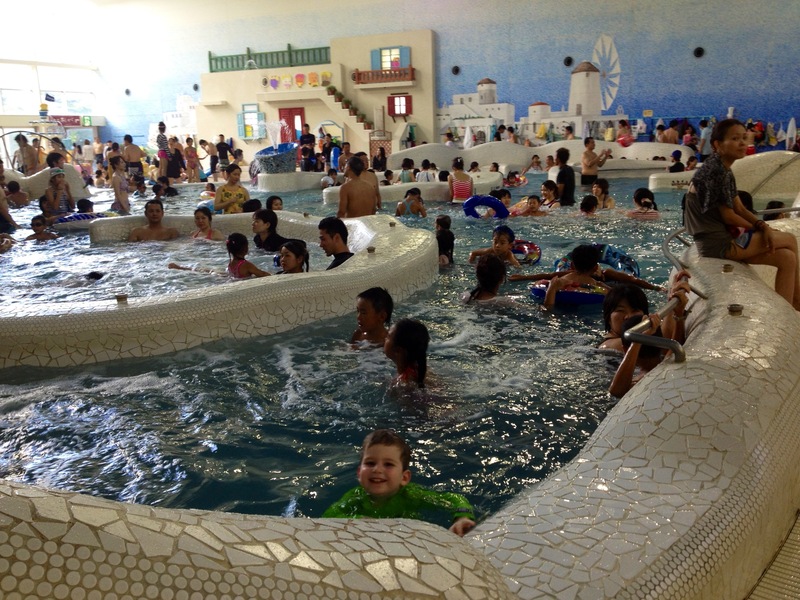 Then, there are two smaller attractions, an indoor tunnel where dolphins swim around you called Dolphin Paradise, and an outdoor area with pools where you can touch the dolphins, beluga whales, starfish, etc called Fureal Lagoon. Kids can get wet and dirty wading in fabricated tidal pools. In addition, there is a nice boardwalk where you can enjoy watching boats, wake boarders, and even beach goers across the bay. One area of the park has fishing with poles to rent. There are many dining options, from nice sit down restaurants to food courts and take out. There was no problem with bringing in our own food and drink either. From the parking lot it is about 250 meters to the bridge, which you then must cross to get to the entrance. 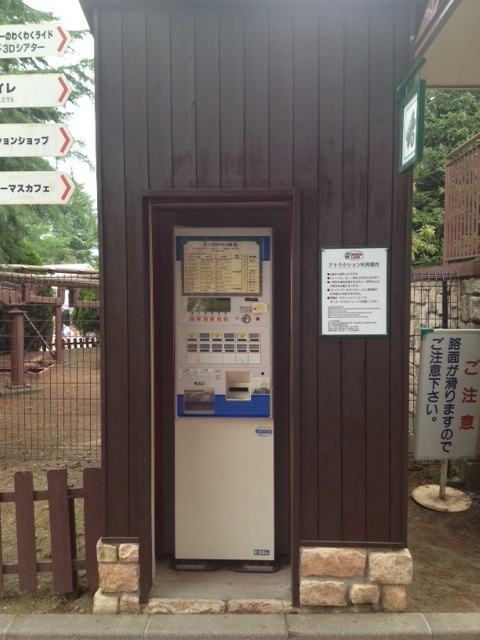 Stroller rental was ¥500 and located on the parking lot side of the bridge at the info center. Cross the bridge and go down the steps to find the ticket booths. There are multiple options for buying tickets – the all-inclusive for adults in the summer is ¥4900, ¥3500 for school children, and ¥2000 for kids over age 4. 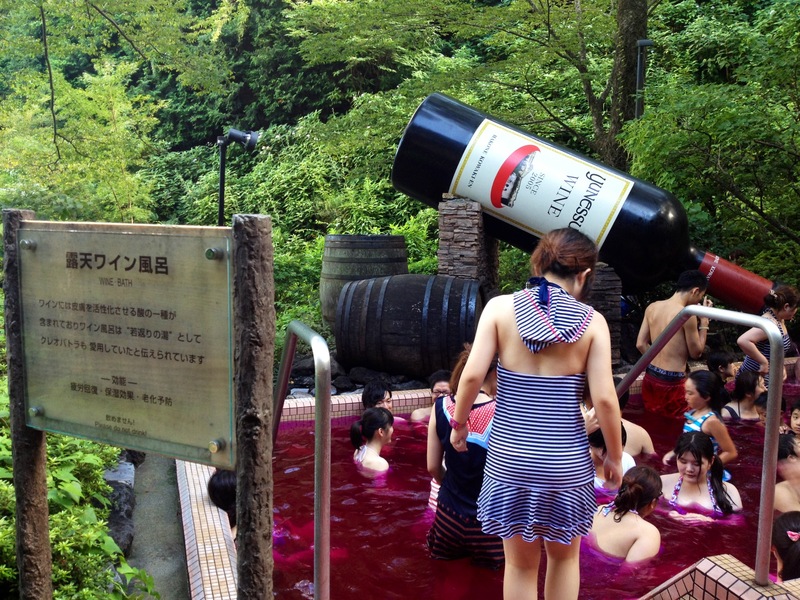 Costs run a few hundred yen per person cheaper in the winter. 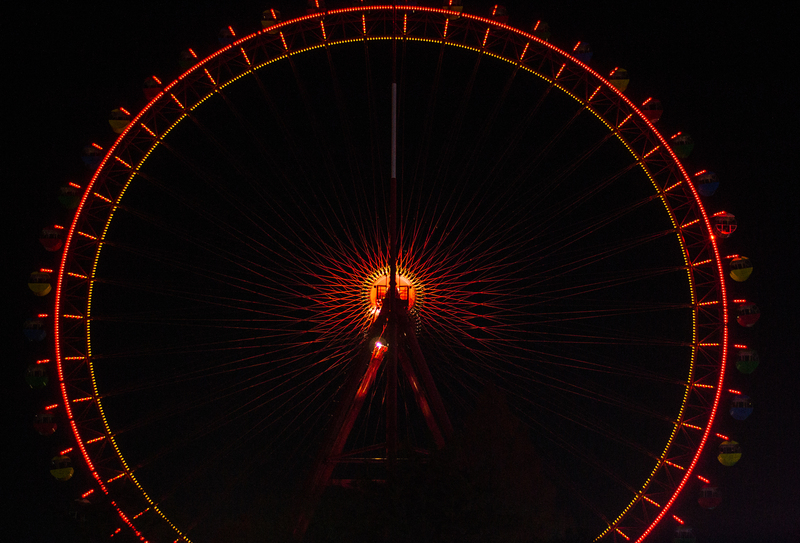 You can also buy tickets just for the aquariums or just for the rides. You can actually roam the grounds without a ticket, it is a well-kept, spacious island. Sea Paradise coordinates: 35.338129, 139.646484. DIRECTIONS: Follow 16 as if you are going to Yokosuka. 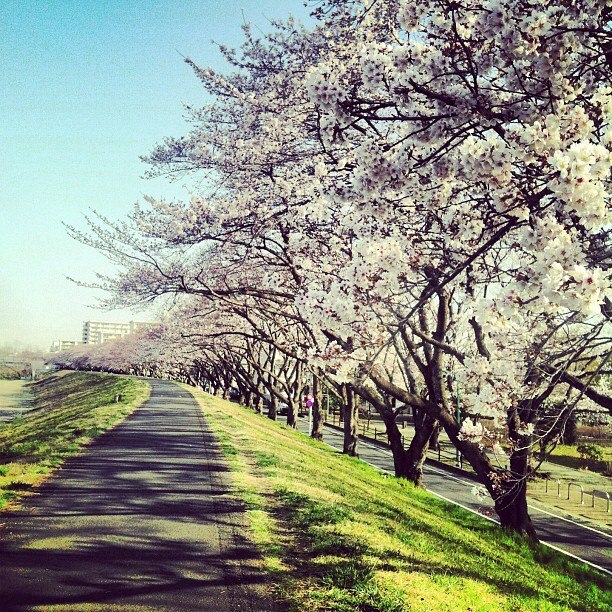 You will pay ¥250 at the Hachioji bypass. 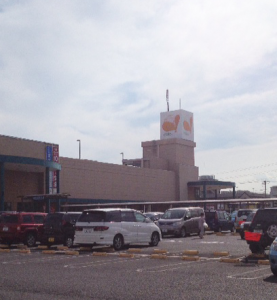 Past the Grandberry Mall you will get on the Yokosuka Yokohoma Road. Take Exit 4-1 to the left and pay the ¥800 exit toll. You won’t go far, then exit 4-3 to the left. Follow signs to go right on 357 (there will be a business there called NAPS at the correct turn). 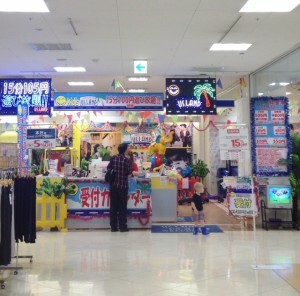 Sea Paradise is directly in front of you, someone will direct you to turn left to parking, which costs ¥1000. In terrible traffic it took us almost 3 hours to get there, but that seemed unusual. It only took 2 hours to get back. – Amanda Martin, June 2013, Photo by Cameron Hill, June 2013. 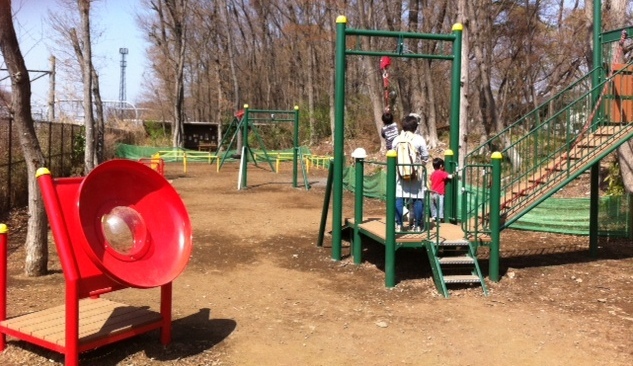 A trip to ASOBono may be expensive, but for kids ages 6 and under it can be a really fun day and a chance to do something different in the city. It is clean, bright and colorful like Bornelund, but larger and with different features. 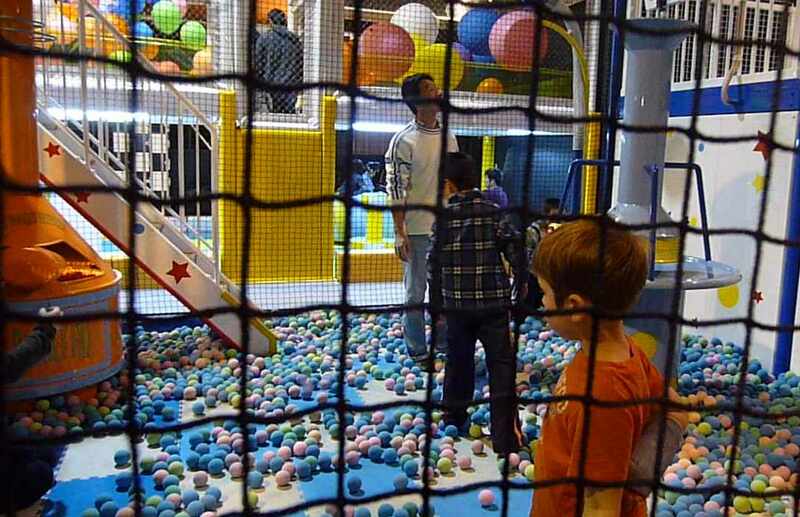 Like Bornelund, there is a large ball pit area. However, here it is set up to look like a pirate ship in a blue sea. There is also a huge train track area with moving trains. 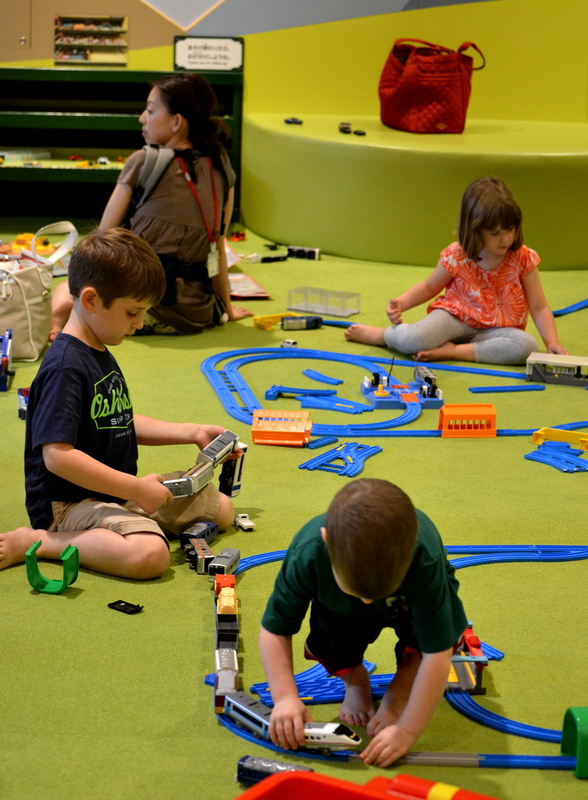 Kids can put the easy to assemble, plastic train tracks together to make complex mazes and run battery operated trains across them. For my 5 year old son, this was the highlight of the trip. Great for pretend play, there is a big kitchen, grocery store and restaurant area for kids with plastic food and shopping carts. 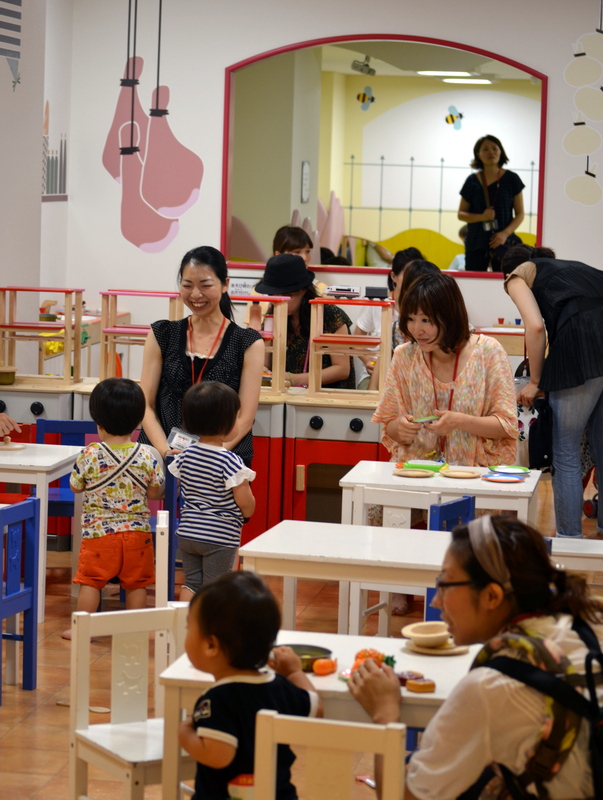 A play bakery is filled with play cakes to decorate and a home area has dolls, doll clothes and vacuum cleaners. 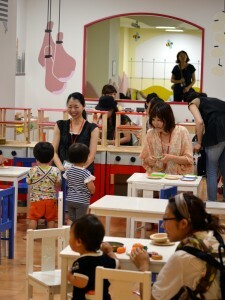 There is a doll house zone, magnetic boards, game area and a large play area just for crawlers and new walkers. Vending machines carry juice and milk boxes in addition to soda and water and there is a nice place to sit and enjoy your beverage. When it is time for lunch, OsoBono is located next to a food court where you can eat your own food or buy from several vendors serving noodles, rice dishes and even soft serve yogurt. With an all day pass you can come and go from ASOBono. 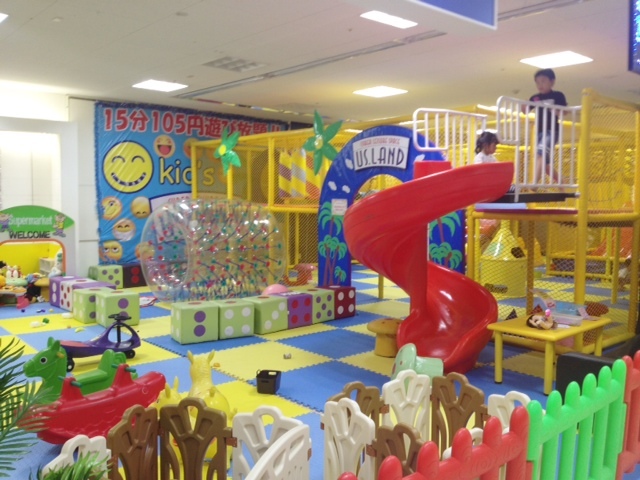 The day pass costs: ¥1500 for children ages 6 months to junior high, ¥900 for adults and ¥200 to rent a locker. 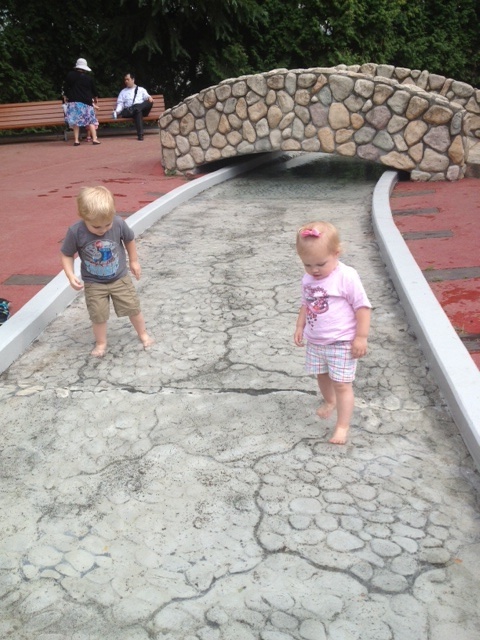 There is stroller parking and no strollers are allowed past the entrance area. 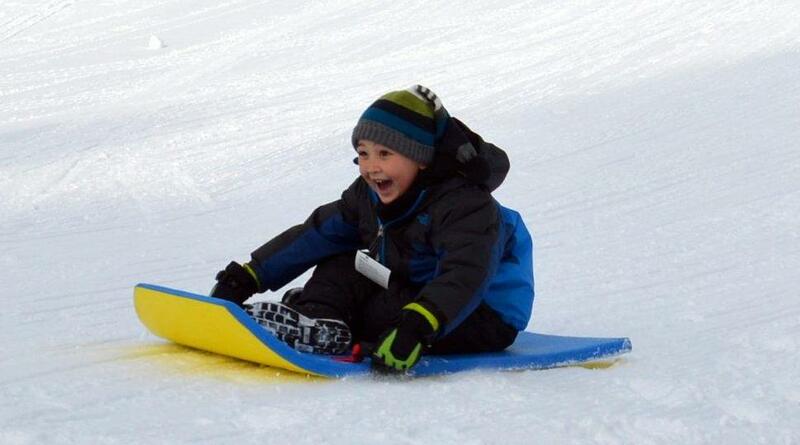 Open weekdays 10am-6pm, weekends 9:30am – 7pm. GPS for parking garage nearest ASOBono: 35.703829, 139.754789. DIRECTIONS: The nearest train station is Suidobashi. However, if you are going with kids, it may be easier to drive. 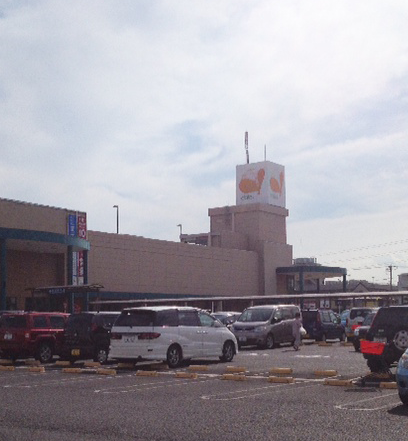 We went on a weekday from Yokota, leaving at 9:30am and got to the parking area next to ASOBono in just over an hour. We drove out of the parking garage and were on our way home at 3pm and it took us just one hour to get back to Yokota. The trick is to avoid rush hour traffic. Parking costs ¥400 for 30 minutes, but during the week maxes out at ¥1500. If you get your parking validated at AsoBono and keep your stay under 4 hours, parking will cost ¥1000. So… for one adult plus two kids driving from Yokota it will cost: ¥4100 entry, ¥1000 parking 4 hours, ¥3000 tollways = ¥8100. It worked well to team up with a friend and share parking and toll costs or it may be a fun think to do if you are already staying in downtown Tokyo. – Sarah Straus & Linda Bell, June 2013. 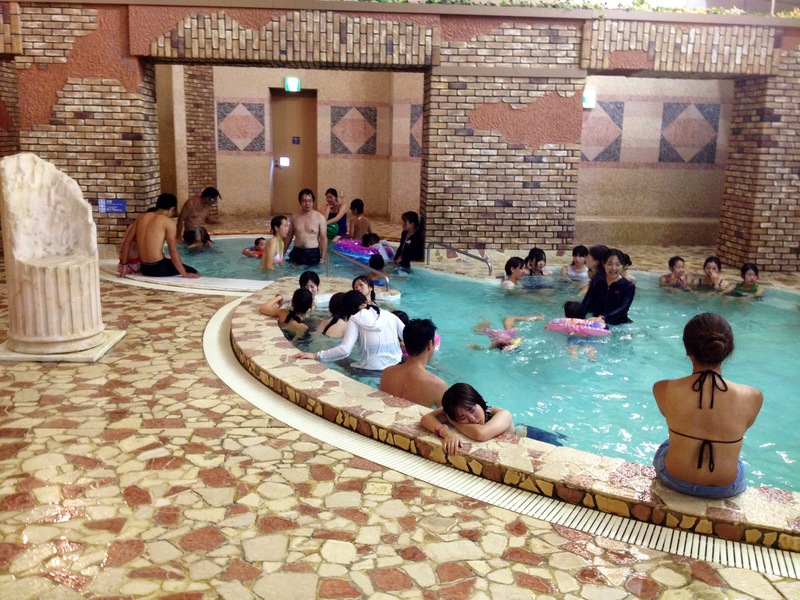 Also see LaQua Spa also at Tokyo Dome City. Ueno Park is one of the most popular attractions in the city of Tokyo and one of the livelier sites during the annual Cherry Blossom season in early April. Ueno has many things to offer and should be visited at least once during a stay in Japan. Ueno Zoo is one of the largest in the world and attracts “kids” of all ages. The animals’ names are written in English. As a special attraction, the zoo houses pandas from China. A monorail connects the main zoo area with the Africa section on the west side. You can also cross a bridge over historic Shinobazu Lake where thousands of ducks and cormorants swim. The Shinto shrine on an island in the lake makes a striking picture. Rowboats are available for rent. Also, next to the lake is the Ueno Zoo Aquarium with more than 500 species of fish exhibited on four levels. In the park there are numerous museums that are nice during the winter months when it is too cold to be outside. Tokyo’s National Museum is an imposing structure built in 1936 in modern Oriental style. It displays many of the important national treasures and cultural properties of Japan, including ancient tapestries, screens, samurai armor, swords, scrolls, kimonos, ceramics, and more than 100,000 works of Japanese, Chinese, and Indian art. Ueno has a very good National Science Museum (see separate entry) with special sections on zoology, botany, geology, science and engineering, and astronomy. 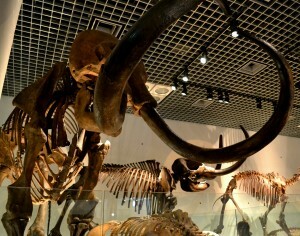 Children will be awed by dinosaur and whale skeletons, and by the collection of clocks and stuffed animals. Even Mexican mummies and shrunken heads can be found here. (Although very little is in English and adults may not be impressed, the museum can be a good learning tool for children.) 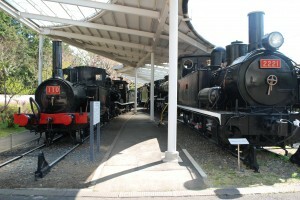 The National Museum of Western Art is also located in Ueno Park. It was built in 1959 and exhibits the works of French artists. This exhibit features masterpieces by such famous artists as Monet, Renoir, Picasso, Van Gogh, as well as several sculptures by Rodin. All of these attractions are open daily 9:00 am – 4:00 pm, and closed Mondays and from December 29 – January 3 during the Japanese New Year. Entrance fees for each of the attractions range from ¥200 to ¥400 for adults; ¥100 for 13 and up; ¥50 for 3-12; those under 3 and over 65 are free. 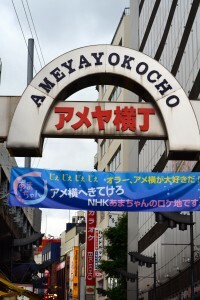 You may also want to explore the Ameyayokocho shopping district which runs south from Ueno to Okachimachi Station. Famous for hundreds of tiny discount shops, second-hand motorcycle dealers, and open air markets, it offers countless small inexpensive restaurants where you can make a good lunch of noodles, tempura, yakitori, or other specialties. 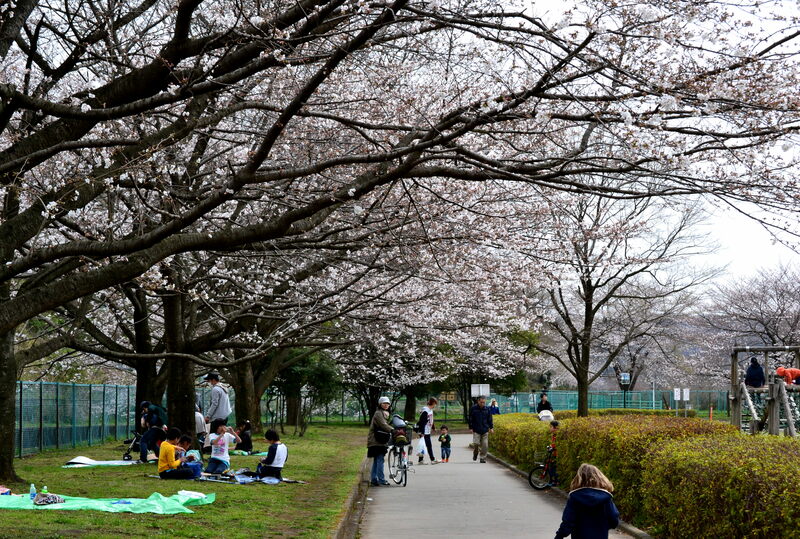 A picnic is a nice alternative because there are numerous places in the Ueno Park area where you can sit, relax and watch all the people go by. So enjoy your visit! TRAIN DIRECTIONS: To reach Ueno, take the Ome Line to Tachikawa and change to the Chuo Line toward Tokyo. Get off at Kanda, three stops after Shinjuku. Change to the Yamanote Line toward Ikebukuro, and get off at the third stop, Ueno. Check train times on Hyperdia. – Chris Underwood, Mugs Wedemeyer, date; updated Sarah Straus, May 2013, top photo by Lorri Shrewsbury. This Tokyo aquarium is not big, but it is quaint and entertaining. 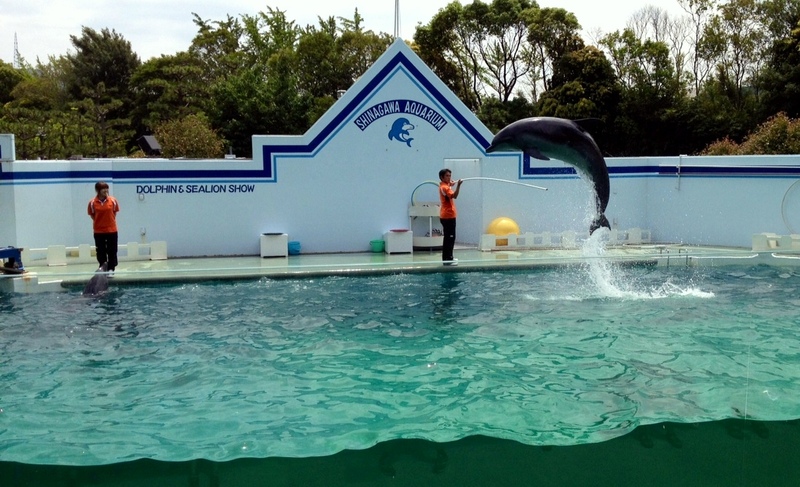 They have a small dolphin and sea lion show with two dolphins and two sea lions. There is an extra sea lion show in the morning and on the weekends. 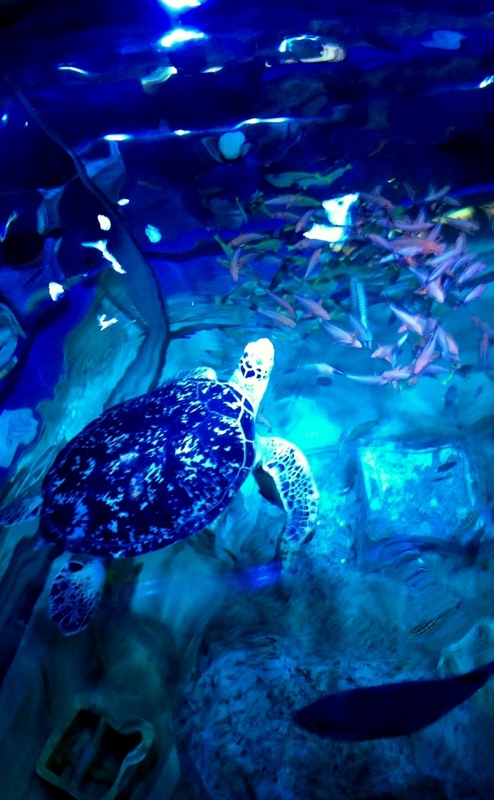 They also have an underwater tunnel with a massive turtle and stingray as well as other fish and eels. In smaller enclosures there are exotic crabs, jellyfish, penguins and two large sharks are located just before the exit. Strollers can be used, but the place is quite small and on a busy day it may be difficult to move. 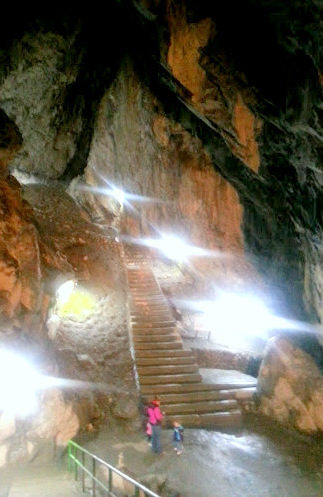 On the Saturday we went, it was easy to use the ramps and elevators. Strollers can, however, be stored at the front of the Aquarium. There is no ramp to the Splash zone, but kids in strollers can see the dolphins and seals underwater when you take the elevator to the basement. Bring extra clothing if you want to sit in the Splash zone. Outside the entrance are lockers for valuables and refreshments. You may enter and exit the Aquarium with your day-pass. No food is allowed inside, but there are picnic tables right outside the entrance that overlook a small downtown lake -perfect for a stroll on a nice day. Adjacent are “Restaurant Dolphin” and other noodle and ice cream vendors. Drinks can be bought in the vending machines in the basement of the Aquarium. 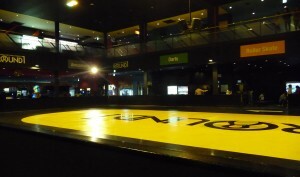 Admission for adults: ¥1300. 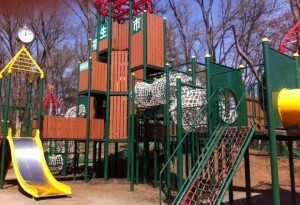 Junior high – Elementary students: ¥600. Children above age 4: ¥300. Hours: 10am – 5pm, closed Tuesdays and Jan 1. For more details check www.aquarium.gr.jp/en/. GPS to parking: 35.588755,139.738924. DRIVING: In light, Saturday morning, traffic it took 1 hour and 15 minutes from Yokota for me to get there. Depending on your route, prepare for a few downtown tunnels to interrupt your GPS navigation. I drove because taking the train would take longer and be more difficult with small children. 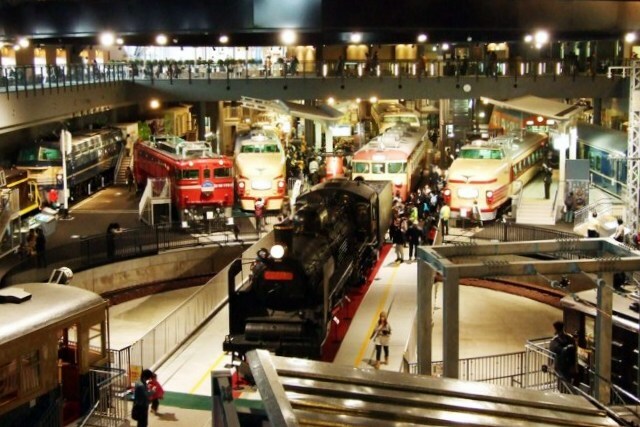 If you take the train, make your way to Omorikaigan Station. The aquarium is walking distance from this station. If you don’t want to drive or take the train, check ITT. They offer trips here on occasion also. There is parking, but there are only 96 parking spots. I had no problem getting parking soon after it opened. 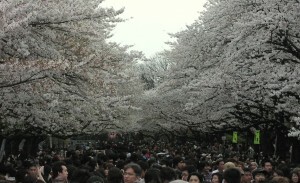 It cost us ¥1000 for parking, and we were there for three and a half hours. I am not sure if it was a flat fee. The parking lot is directly behind the main entrance of the Aquarium, and off of Route 316 (NOT Route 15 which is the Aquarium’s train-user’s entrance), near a tiny lake. You need to cross over a bridge just before the parking lot’s entrance which is on the left. Do not use the Aquarium’s physical address for a GPS destination as it will take a lot of time to loop around confusing traffic, and non-designated parking zones, to the ‘back’ side of the Aquarium. 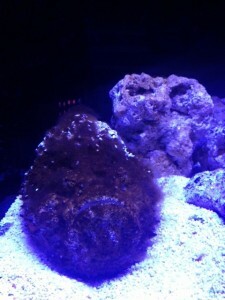 Interested in Aquariums? 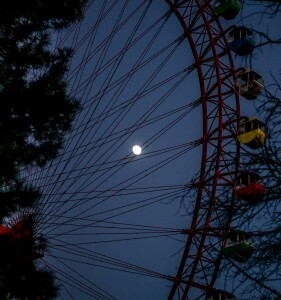 Also see the entry on Sunshine City and Tokyo Tower. 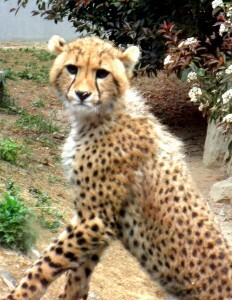 Visiting Gumna Safari Park is a fun way to spend the day, particularly with kids. We went to celebrate our 3-year-old’s birthday and she loved it. Upon arrival pay ¥300 to park in the ample lot. The main attraction is a ride through the safari park. Adults are ¥2600 and kids ages 3 and up are ¥1300. 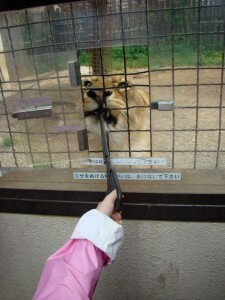 Additionally, it costs ¥500 per person to ride on the zebra bus (no feeding the animals) and ¥1300 per person to ride on the lion or tiger buses. The lion and tiger buses include grass for the grazing animals and meat to feed the lions and tigers. 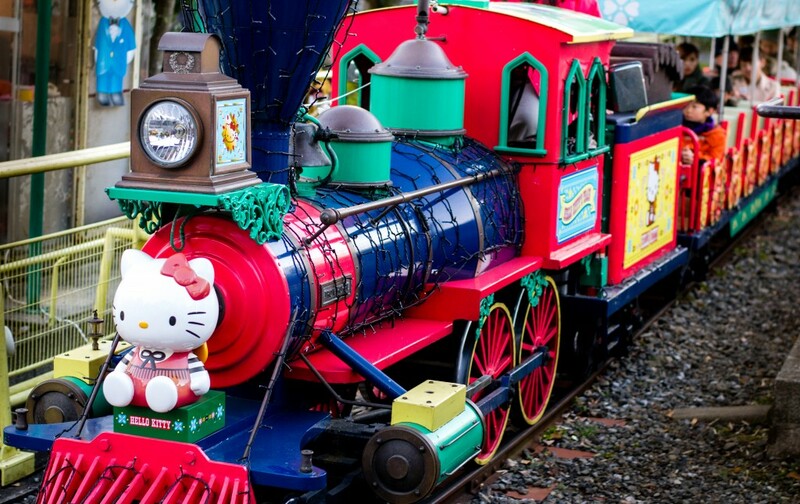 The ride takes about 80 minutes, including a 30 minute stop at a petting zoo. At that stop there are also great opportunities to see big cats, including a glass ceiling walk through with tigers above. The highlight for our family was feeding the lions with tongs that extend out the wire covered windows of the bus just inches from the lions mouth. We also fed antelope and zebras, and saw giraffes, bears, monkeys, rhinos and more. 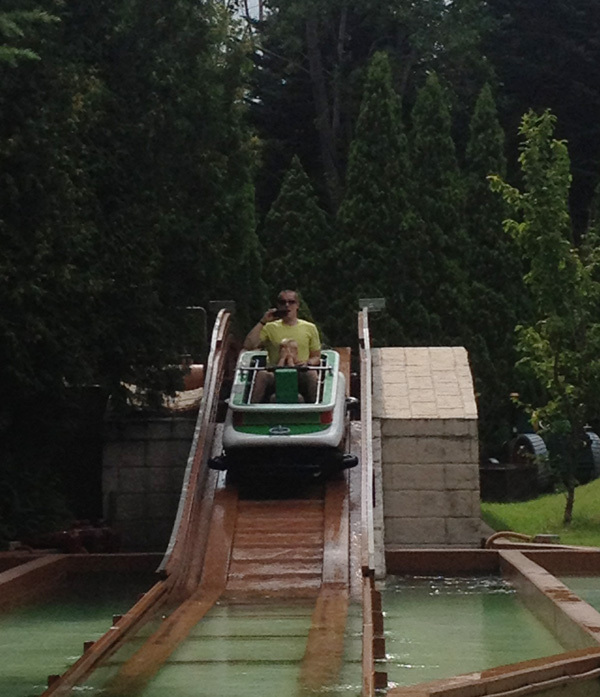 It is also possible to drive your own car through the park. It opens at 9:30am and we spent about 3 hours total. 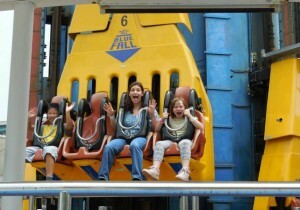 We went on a Saturday and the park was not too crowded. In addition to the Safari Park, there is a very well done gift shop, a restaurant with decent quality Japanese food at about ¥1000 per person, and a small amusement park. 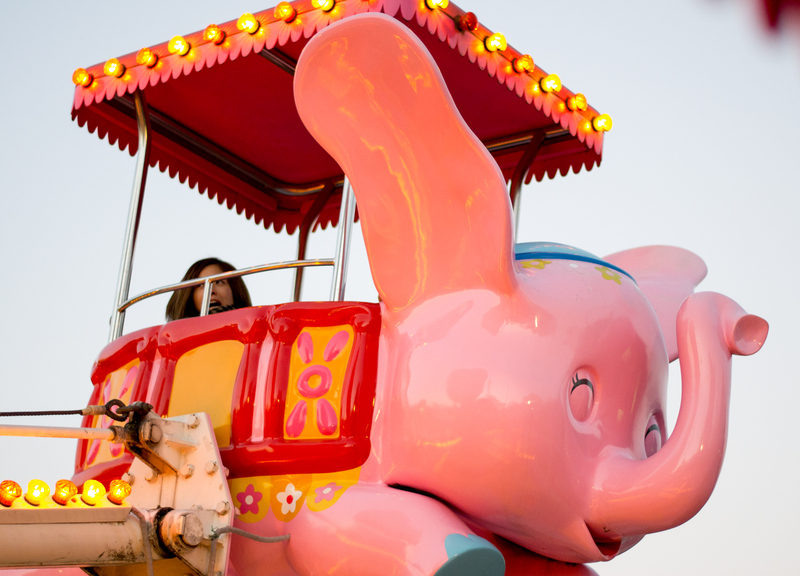 Older but fun, there is a carousel, Ferris wheel, swings, teacups, small roller coaster, and a few other rides – good for kids age 8 and under. 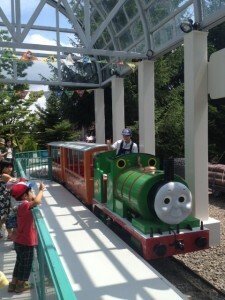 Each ride cost ¥200. DIRECTIONS: Turn right out of the terminal gate onto Route 16. Immediately past Costco (9 kms) take the ramp on left labled KEN-O expressway 45 to Iruma. Go about 1 KM, then take a ticket from the toll booth and keep right to merge onto the KEN-O northbound. Go 14 KM and there is a major grouping of exits – exit on the left onto the Kan-etsu expressway in the direction of Niigata. Continue on the Kan-etsu for 50 KM, then merge left onto Joshin-etsu expressway toward Nagano. Stay on that for 20 KM. Take Exit 3 (Tomoka), pass through the tolls (2650yen) and continue north for 1.7km. Turn left toward route 198 for 1.2 km, then turn left onto 198 for another 2.3 km. You will go under the highway, and be following signs with zoo animals on them. Turn left on route 193, go 800 meters, and take a right into the park. We encountered almost no traffic, and the drive was 90 minutes each way. – Amanda Martin, May 2013, Photos by Amanda Martin & Kelly O’Donnell, 2013. 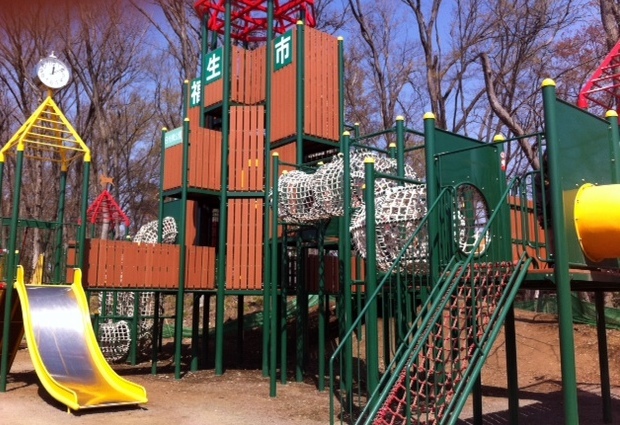 Comments – Linda Bell, May 2013: When we went (May 24 2013), a half price discount was offered from their www.safari.co.jp web page, so an adult entrance fee was ¥1300, junior high school was ¥650. We used google translate to locate the discount. Our GPS (Garmin) led us astray a little when used the park’s address as the destination, and it did appear they had recently upgraded the roads close to the park. We also didn’t recollect any Safari signs from the expressway. The directions in the outline above would be more accurate. 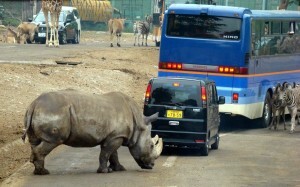 We’d suggest sitting on the left-hand side of the feeding bus as the majority of the animals were on this side. Once you get on the bus, you first drive past some herbivores, then you get off at a mini-zoo with caged and petting animals. 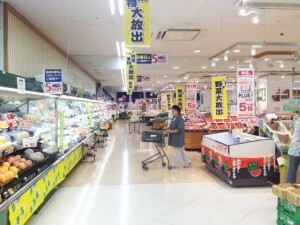 You can buy more feed here for ¥100. After 30mins (the bus driver will hopefully tell/show you a time before you disembark), you re-board the same feeding bus and you pass more herbivores before you enter the enclosure with lions and tigers. Then you exit the safari park through the same herbivore enclosure as you began. Our entire trip took 90mins. The day we went, the feeding bus basically left every hour, on the hour. Strollers are not permitted on the feeding bus, but the park personnel showed us a rather unsecured place designated for their storage. 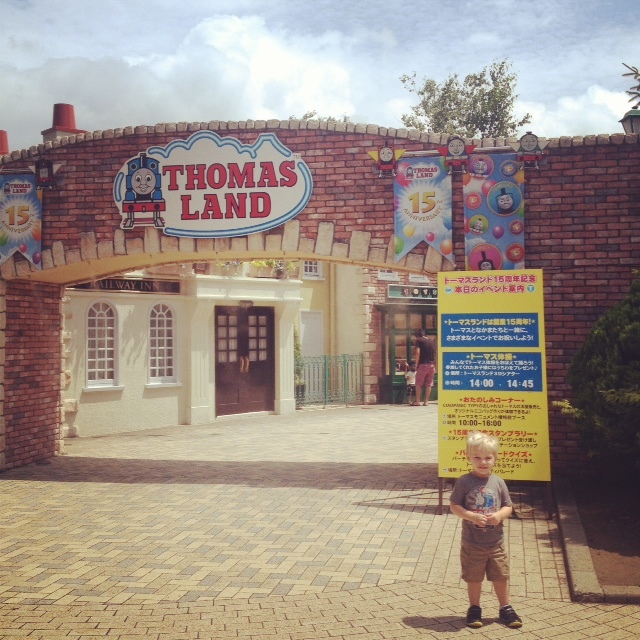 We spent a bit of time at the mini-amusement park. Good fun for young kids. There is a ~2min pony ride which costs ¥300 at the back of the amusement park. 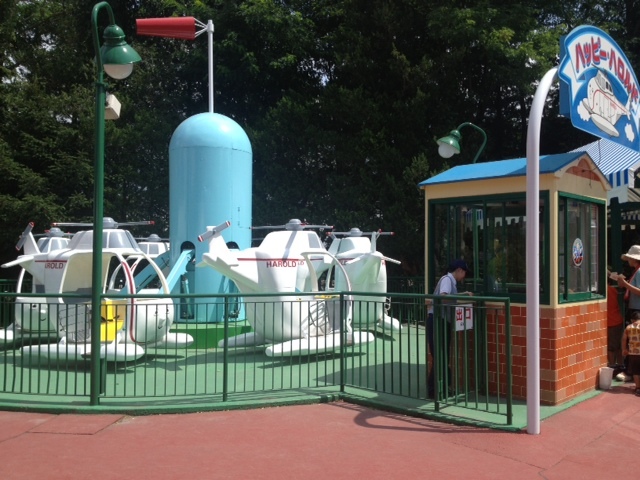 Soft serve ice cream can be purchased down by the pony ride – ¥300 too. A stroller/carrier would be helpful for infants visiting the mini-amusement park. There are picnic tables available in a picnic hall. 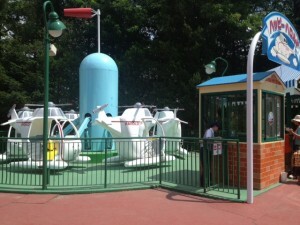 This is located just outside the mini-amusement park and shops. We took our own food. —-Interested in Safari Parks? 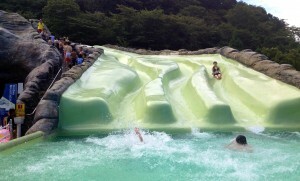 Also check out the trip report on Fuji Safari Park. For parents who love the sciences and want to share them with their children, the National Museum of Science and Nature in Tokyo is a wonderful place to spend the day. 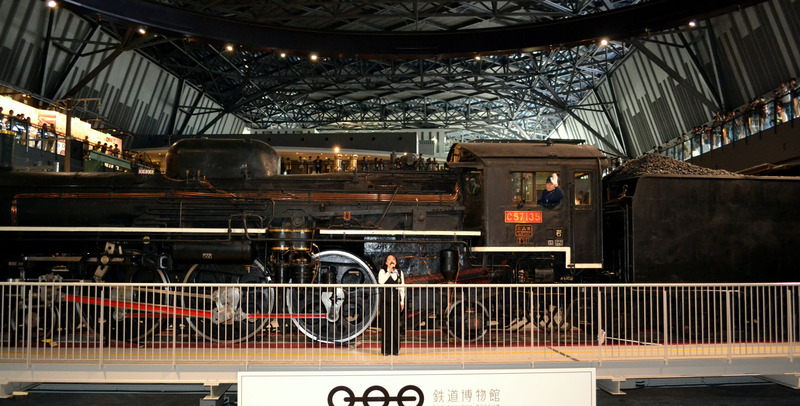 Located in Ueno park across from Ueno Zoo, this museum proved a surprisingly fun outing for my family when we found ourselves in Tokyo on a cold winter day. 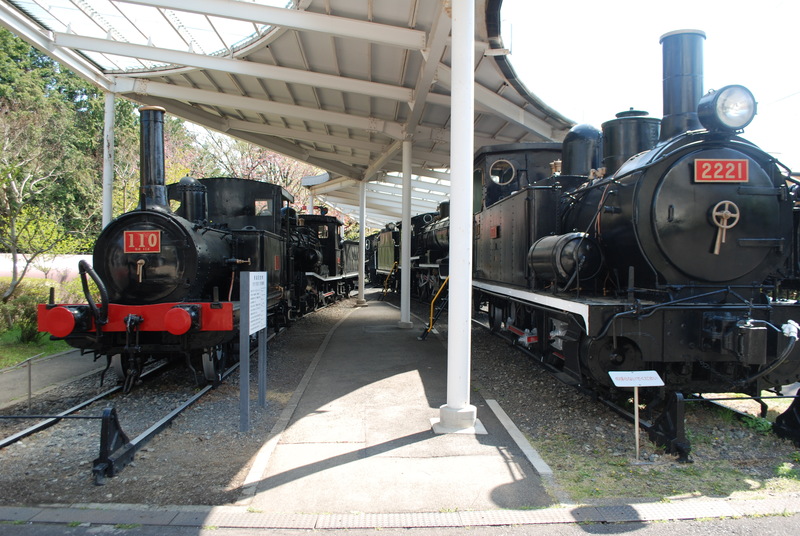 The museum is housed in two distinct buildings: the smaller Japan Gallery and larger Global Gallery. 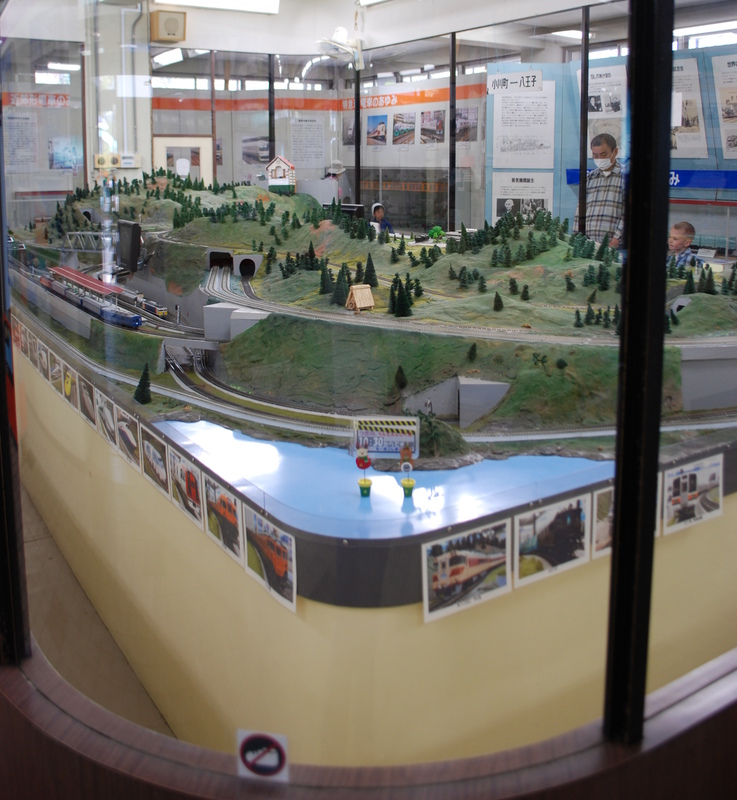 Enter through the Japan Gallery. 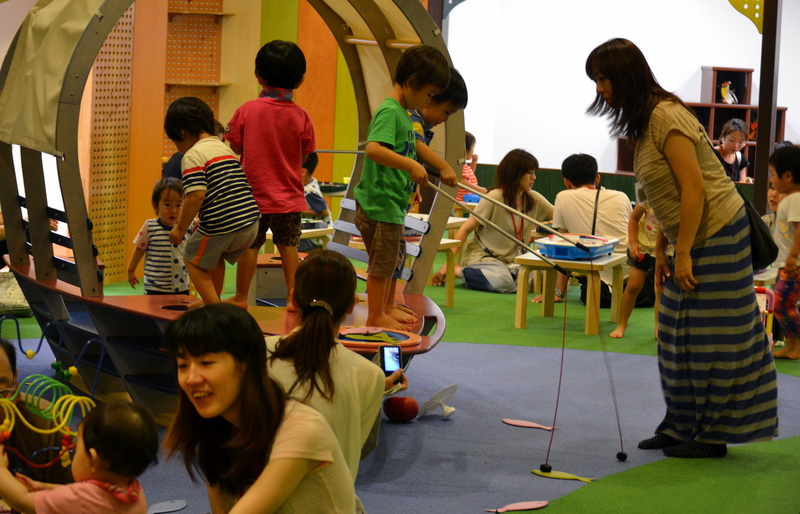 Admission is only ¥600 for adults; high-school age and under are free. Be sure to drop your bulky items off at the lockers and head to the Global Gallery located out the back door of the Japan Gallery, up a short flight of stairs and to the left. It is certainly worthwhile to visit every floor. 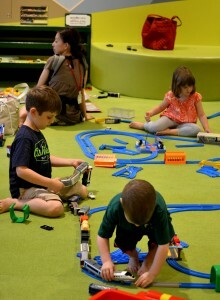 If traveling with younger kids, be sure to find the Science All Around Us room on the 2nd floor. It is filled with hands on experiments that demonstrate principles of mechanical force, light, motion, electricity and more. 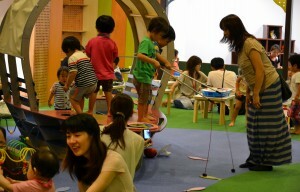 Even our 3-year-old could participate and there are many volunteers here explaining how it all works. 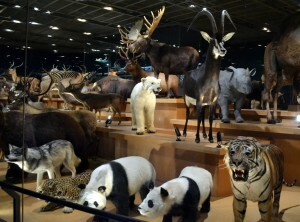 Additional interactive displays suitable for younger kids can be found on the 3rd floor including a unique collection of taxidermy wild animals. Touch screen monitors around the exhibit allow you to see photos or watch short movie clips of each animal found in the large display case. Heading down to the basement levels be sure to stop at B2 for the impressive Evolution of Life exhibit which includes an extensive bone collection. For older kids the best floor may prove to be the one at the very bottom, B3. 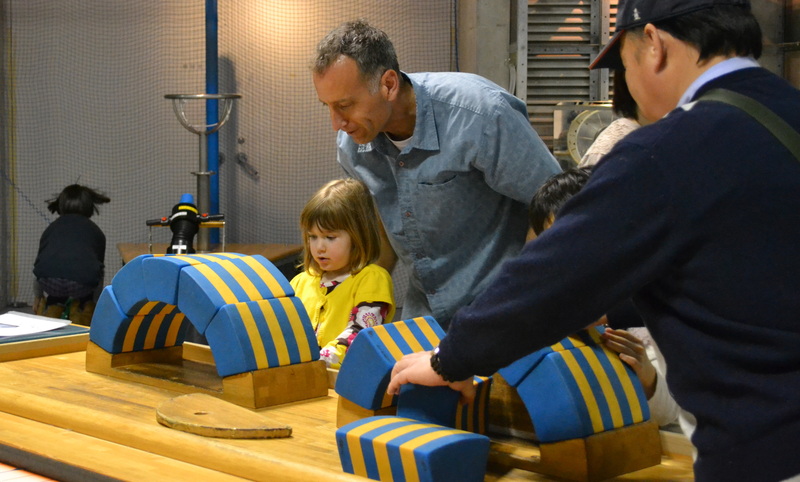 This floor is filled with hands on experiments that explore the laws of physics and matter. Stay for lunch. 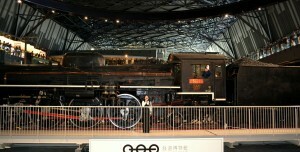 There is a restaurant that can be seen from the 1st floor exhibits and resides half way between the 1st and 2nd floor. It is reasonably priced and has spaghetti and pizza on the kids menu… though there is shrimp on the kids pizza. Open 9am-5pm, closed Mondays and Dec 28-Jan 1. DIRECTIONS: It is easy to get here from The New Sanno. 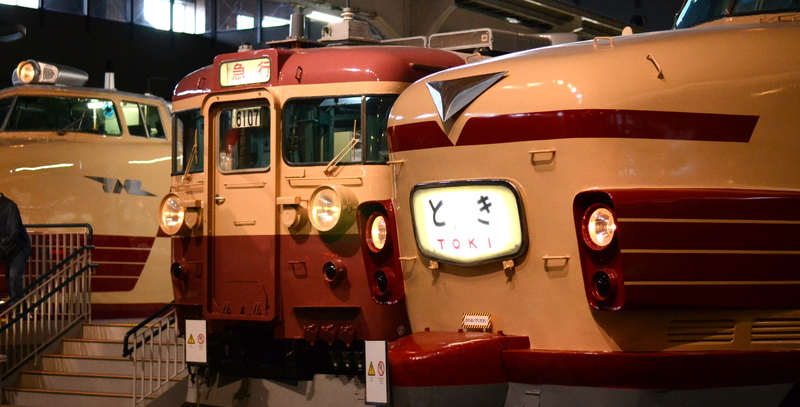 Simply get on the train at Hiroo (H3) and get off at Ueno Park (H17). Check this train map to get directions from Fussa to Ueno: www.hyperdia.com. It predicts about 1 hour and 10 minutes travel time and gives several routes. From what I could tell there is some paid parking near the Ueno Park train station. 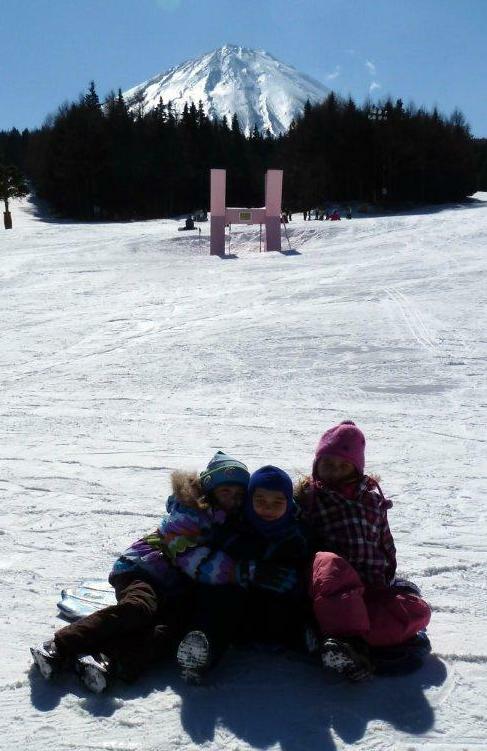 GPS coordinates: 35.715729,139.777341. – Sarah Straus, December 2012. Balance on the edge of an Egyptian palace, enter a den of crocodiles and become lunch for a giant gorilla all at the Trick Art Museum. 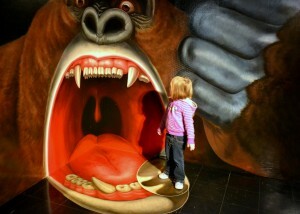 The optical illusion exhibits found here are a delight for kids and adults alike. It is located at the base of Mt. Takao, directly across the street from the Takao-san-guchi train station. 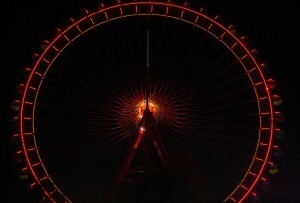 Bring your camera, taking photos is encouraged and in some cases the optical illusion is easier to see through the eye of the lens. 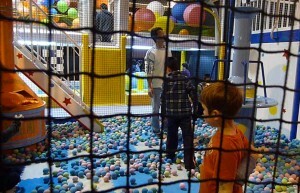 This is a fun indoor adventure, good for a rainy day or in combination with a short hike on Mt. Takao. It opens at 10am daily and is open year-around but does have some closures. Check the visitor information page before you go to make sure it is open and print the on-line coupon to save ¥200 per person on admission. DIRECTIONS: See Mt. Takao entry for driving directions. 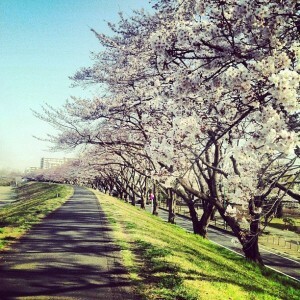 GPS coordinates: 35.632858,139.271061. 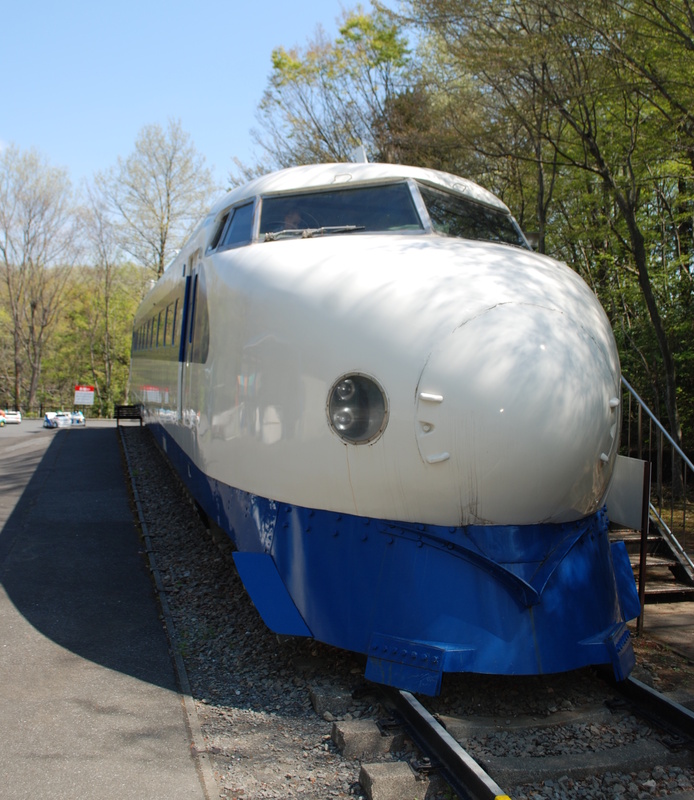 Take the train to Takao-san-guchi train station or drive and park at the Takao-san-guchi parking lot for ¥1000 on the weekend. – Sarah Straus, December 2012.